Use TB1A80C to reference this item. This coin is being released to help raise awareness of bikes on the road. Some Situations When Crashes are Most Likely to Occur. Car making a left turn: A driver is attempting a left turn in front of you. Riding in a driver's blind spot: You are riding in the driver's blind spot and the driver may not see the motorcycle. Additionally, the driver may fail to adequately check blind spots before changing lanes or making turn. Hazardous road conditions: Potholes, wet leaves, railroad tracks and other road obstructions may dictate that you take an action that a driver may not or does not anticipate. Obstructed line of sight: Large vehicles, such as sport utility vehicles, delivery vans, and large trucks may block a motorcycle from a driver's view and you may seem to suddenly appear. 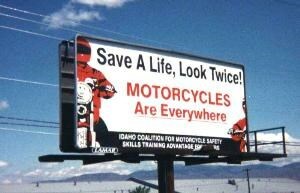 Make yourself visible to motorists! This coin is in memory of Todie Phillips of Manitou Beach, MI. He passed away August 12 2008 as a result of a motorcycle accident, he was only 49 years old. This is one of the most unique looking coins I have seen so far. I just spent a week in Michigan (Cadillac and Waterford) a few weeks ago. I had a great time in your state. Thanks for sharing your coin and keeping us aware of Motorcycles and their right to share the road. Grabbed this one and will be moving it along soon. Stopped here again to swap GC & TB. Decided to park on the road and walk to it again. Very glad we did. Saw two beavers hauling branches to their dam. The hillside nearby had nothing but chewed off stumps. Retrieved this from my cache Rocky Peninsula, probably gonna move it this next weekend.